The Spine Specialist Table performs a procedure called ?Laser Assisted Spinal Restoration? which is truly the evolution of Non-Surgical Spinal Disc Treatments. It utilizes 2 of the most technologically advanced treatments for lower back pain, herniated disc, spinal stenosis, pinched nerve, degenerative disc disease and more. At its heart it has a fully robotic computer automated laser delivery system that combines Non-Surgical Spinal Decompression and High Intensity Class 4 Medical Laser Therapy. The Spine Specialist Table helps to re-establish disc height, reduces bulging and disc herniation using Non-Surgical Spinal Decompression Treatments. In addition, it reduces pain, helping to heal the damaged discs, associated nerves, ligament, and muscle tissues through the simultaneous application of High Intensity Class 4 Medical Laser Therapy optimizing recovery and minimizing the chances of the disc injury relapsing. Simultaneous application of High Intensity Class 4 Medical Laser Therapy achieves a more comfortable and complete Spinal Decompression treatment than traditional decompression methods. For Chiropractors and Physiotherapists, the Spine Specialist Table makes patient scheduling efficient and easy! Having 2 modalities built into one 12-15 minute treatment maximizes patient throughput. Up to 4 patients/hour versus only 1 patient/hour with traditional therapies. 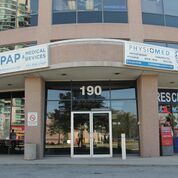 If you want to learn more about The Spine Specialist Table or you want to have an appointment with one of our Spine Specialists, please visit our Toronto location.